In the region of Inca, the first tens of the twentieth century were marked rapid and uneven economic growth, with strong immigrant population movements and odd emigration; although with a net result of increase of its population '... caused by an agricultural and industrial progress which brings considerable labor' (Mascaro Pasarius, Volume II, p. 687). For your business contacts with France, where even possessed stores in Sete, Mallorcan knew well the technical solution to the problem of phylloxera, which consisted vineyard replanting American rootstock. Since 1900, the area under vines in Mallorca is multiplied by four in thirty years, reaching in 1930 the global figure of 8,000 ha. In all the country. Given the nature of the attack of phylloxera, the increase in surface vineyard during these years can be explained only by a strong momentum in the replanting of vineyards; although inferior in quantitative terms that came with almonds. Unfortunately was great for us and the Red Cross experienced the terrible fall from the breakwater pier low.Poor Manuel! With two broken and full of bands and appliances legs, still had all one word of affection and love so much and so cheerful and with so much wit, who seemed to forget himself to make our stay enjoyable at his side. The new vineyard went into production and the July 10, 1911, and therefore before the harvest this year, signed another testamentary memory in which it left the same child, Dn. Emilio José, townhouse Son Bordils, the testator lived, 'as it were the day of death, the cellar with barrels and vats or else it would, the yard or shed where there are wineries,. . '; evident that the old cellar was back in business or was about to sign. Dn. Emilio made new replanting in the second decade of the century, since the October 15, 1912, signed Dn. Manuel a new testamentary memory 'confirming the authorization granted to his son Don Emilio to plant vines Son Bordils, ..'. He must go through a good economic times Dn. Manuel at the beginning of the second decade since the 6th of September 1913 the estate mortgage for Recorder Dn property. José Montero Figueras '... as security for a loan of fifteen thousand pesetas received cash, for between two years and with interest at four and a half per cent per annum ...'. Dn. Manuel Perez Villalonga and died on March 14, 1914. She had suffered two consecutive pneumonia, say as a result of their efforts in trying to harvest vines are Bordils even in rainy days vintage 1913. In 1916, Finca Son Bordils had an area of 621 cuarteradas (441 ha. ), As certified by the Engineer Dan. 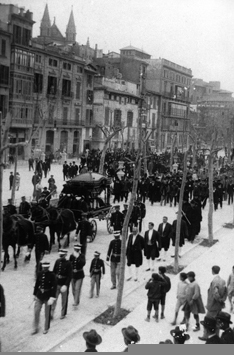 Enrique Ordinas waged in Palma on 25 August 1916 and was second in size among the 12 large farms that existed at the end of Inca. This year the estate was divided after the death of its owner in 1914, Dn. Manuel Villalonga Pérez, 9 servings. The portion that was entered as first and awarded to Dn. Emilio José Villalonga and Boneo, consisted of 125 cuarteradas (89 ha.). In the description of that portion, which included the ancestral home of Son Bordils, it says '... comprises part of the Sementera of Sinia, the portion formerly known per Ses Cinquanta Corteradas Vina ..'; probably it was the extension of existing vineyard in this portion of the estate, in the pre-phylloxera, 25 years earlier stage and had been completely obliterated. They should not do very good things to the new owner Dan. Emilio José Villalonga and Boneo, since January 19, 1918, signed a mortgage on the property with Dn. Sunday Alzina Jaume whom, ultimately in 1922, would sell the farm; but put the name of his wife Mrs. Juana Ana Llabrés of Fontirroig. The new buyer, Dn. Jaume Domingo Alzina was repeatedly mayor of Inca and was a professional in the wine sector. He liked to personally direct crews who performed the harvest in the farm and transport of grapes, with three cars, the 'cellars' Inca. Dn. Sunday would have harvested vines, planted by Dn. Emilio, until the end of its life, but there would be replanted due to bad moment was going through viticulture mallorquina.Ya that Dn. Sunday Alzina Jaume vinificaba grapes are Bordils in the 'cellars' Inca, the old cellar of Son Bordils remained inactive throughout this stage, keeping within the 'carriers' and empty 'congrenyades boats'. According tells Pico (. Pag 87), speaking of the importance of cellars: 'All those rural farms that had vineyard, with rare exceptions, possessed a "cellar", which made their own wine. In most cases this "cellar" was located not in the fields but in the people. And the largest and richest farm was much higher the "cellar" and, above all, architecturally beautiful. (sic). Through times have remained as vestiges of our wine history, subject to so many different swings'. He also must register the same vein in the region of Inca, since 1960, only existed in Inca 146 Ha. You for growing vines. Meanwhile, in a probate, Finca Son Bordils, in 1957, passed to the daughter of Dan. Ms. Juana Domingo and Ana, Ms. Antonia Alzina Llabrés. Ms. Antonia sold the 'congrenyades boats' still kept in the old cellar of Son Bordils. At his death, there was a court case by the legacy of his property that lasted years. Once settled the litigation, the new owners acquired most of the land owned by the Alzina Foundation; about 100 Ha., among which is the ground outlined in the ancient scriptures of the farm as "Ses Cinquanta Corteradas of vinya". Subsequently, the money from the Foundation Alzina this transaction was donated to the City of Inca for the extension of the residence for seniors, "Miguel Mir"; complying with the testamentary intention of Ms. Antonia Alzina Llabrés. In 1996, a four-year program of replanting of vineyards in the grounds of the above "Ses Cinquanta Corteradas of vinya" began. During the years 1996, 1997, 1998, 1999 and 2000 a total 26 ha. Of vineyards belonging to foreign and indigenous varieties were planted. In 1998, the vines planted in 1996 and the varieties merlot, cabernet sauvignon, chardonnay and muscat small grain, entered production and vinified in the new cellar of the Finca Son Bordils. It would be unfair to end this story without spending a single line of what is and has been the pantry and support vineyards are Bordils throughout this story and, ultimately, immovable pillar of the same: the land or the terroir, called the French. The wine, in a way, is only its very essence.